Like everyone else, elite investors make mistakes. Some of their top consensus picks, such as Amazon, Facebook and Alibaba, have not done well in October due to various reasons. Nevertheless, the data show elite investors’ consensus picks have done well on average over the long-term. The top 25 S&P 500 stocks among hedge funds at the end of June 2018 lost an average of 8.8% through October 26th whereas the average stock in the S&P 500 Index lost 9.5% during the same period. Because their consensus picks have done well, we pay attention to what elite funds think before doing extensive research on a stock. In this article, we take a closer look at Starbucks Corporation (NASDAQ:SBUX) from the perspective of those elite funds. “Starbucks is the category killer with a wide competitive moat, underpinned by quality and innovation advantages over low-cost coffee and quick service restaurant (QSR) players, with convenience, technological, and cost advantages compared with higher-end, boutique coffee shops,” Ackman wrote in his hedge fund’s Q3 investor letter, released this week. At the end of the third quarter, a total of 33 of the hedge funds tracked by Insider Monkey were bullish on this stock, a 21% drop from the second quarter of 2018. 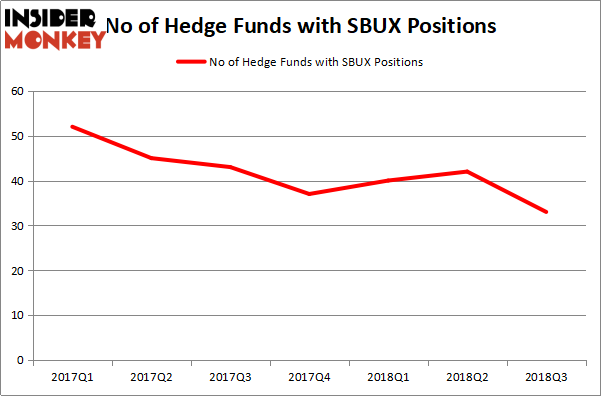 By comparison, 52 hedge funds held shares or bullish call options in SBUX following the first-quarter of 2017. So, let’s find out which hedge funds were among the top holders of the stock and which hedge funds were making big moves. Among these funds, Cedar Rock Capital held the most valuable stake in Starbucks Corporation (NASDAQ:SBUX), which was worth $570.2 million at the end of the second quarter. On the second spot was Balyasny Asset Management which amassed $196.8 million worth of shares. Moreover, Citadel Investment Group, Adage Capital Management, and AQR Capital Management were also bullish on Starbucks Corporation (NASDAQ:SBUX), allocating a large percentage of their portfolios to this stock. Since Starbucks Corporation (NASDAQ:SBUX) has witnessed falling interest from the aggregate hedge fund industry, logic holds that there is a sect of funds that slashed their entire stakes last quarter. Interestingly, Peter Rathjens, Bruce Clarke and John Campbell’s Arrowstreet Capital dropped the largest stake of the 700 funds monitored by Insider Monkey, valued at about $66.6 million in stock, and James Parsons’ Junto Capital Management was right behind this move, as the fund dropped about $33.3 million worth. These transactions are important to note, as total hedge fund interest dropped by 9 funds last quarter. Let’s also examine hedge fund activity in other stocks similar to Starbucks Corporation (NASDAQ:SBUX). These stocks are Danaher Corporation (NYSE:DHR), BlackRock, Inc. (NYSE:BLK), Charter Communications, Inc. (NASDAQ:CHTR), and EOG Resources Inc (NYSE:EOG). This group of stocks’ market values match SBUX’s market value. As you can see these stocks had an average of 49 hedge funds with bullish positions and the average amount invested in these stocks was $3.27 billion. That figure was $935 million in SBUX’s case. Charter Communications, Inc. (NASDAQ:CHTR) is the most popular stock in this table. On the other hand EOG Resources Inc (NYSE:EOG) is the least popular one with only 37 bullish hedge fund positions. Compared to these stocks Starbucks Corporation (NASDAQ:SBUX) is even less popular than EOG. Considering that hedge funds aren’t fond of this stock in relation to other companies analyzed in this article, it may be a good idea to analyze it in detail and understand why the smart money isn’t behind this stock. 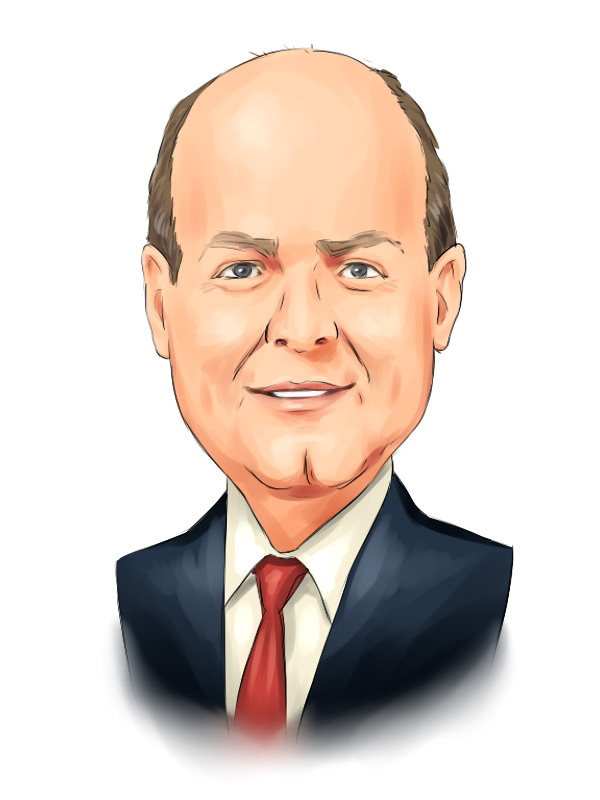 5 Stocks Hedge Funds Can’t Live Without As 13F Deadline Looms Novo Nordisk A/S (NVO): Hedge Fund Sentiment Going Nowhere The General Electric Company (GE) End Game: Bataan Death March or Turnaround... 4 Stocks Billionaire Ray Dalio Bought in Q3 (and 1 He Dumped) Hedge Funds Are Buying Banco Santander, S.A. (SAN) Is Rio Tinto (RIO) A Hidden Gem or a Chunk of Coal?